One of the most interesting and important parts of Bangkok deserved its own guide, and here you have it. With its vibrant nightlife, we are sure that you will not want to miss out the opportunity of visiting it. Here you will find everything you are looking for: history, attractions, tips and more. This is the most complete guide you will find in the internet. Therefore, if you are visiting BKK any time soon, or are already here, then give this a read and all your doubts shall be answered. Before taking a look to the history of the location, let’s see how you can arrive here. How to Arrive to Soi 11? You can always take a taxi and tell the driver to drop you here from any spot in Bangkok. However, here you will find answers to some special scenarios. How to Get from DMK to Soi 11? Unfortunately, there is no train that will take you, therefore, your best choice is to get a taxi. There is no other way around it, because it is your only option. Although, worry not, because the prices are quite accessible. How to Get from BKK to Soi 11? Good news for you, because unlike DMK, here you can rely on the train to arrive to your destination, because it is much cheaper. However, if you are traveling with another or more persons, then taxi will be more reliable and cheaper. How to Arrive to Soi 11 from Suvarnabhumi Airport? Identically to the DMK case, your best choice is to go on a taxi. This is especially the case if you are traveling with more persons, because the hassle of traveling in train is not worth it. 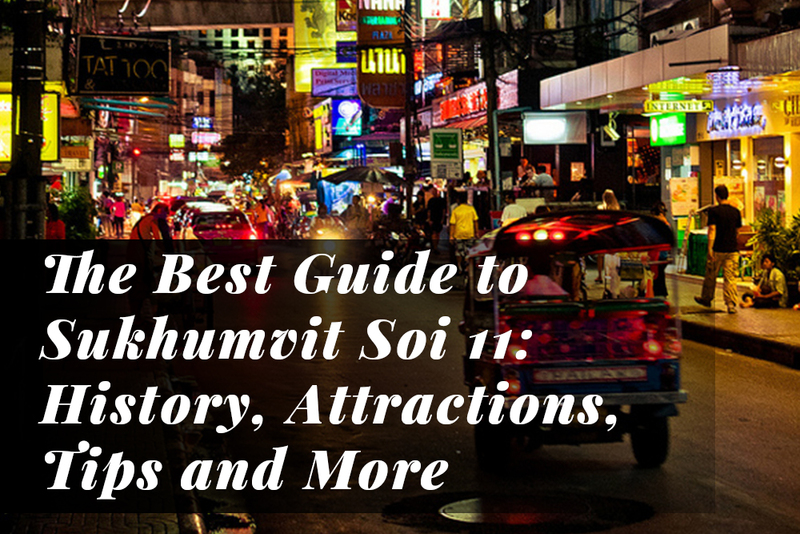 The most exciting Soi in lower Sukhumvit has an interesting history, and you are going to discover all about it in this section. It is right in the center of the city, and not in vain it has become in one of the most popular attractions in BKK, because this street has got everything you need to enjoy the nightlife this city has to offer. Before we talk about Soi 11 in concrete, it is precise to talk about the history of Sukhumvit, one of the most exclusive districts in Bangkok. The Sukhumvit Road is the longest in Thailand it is divided in Sois, from which the number 11 is one of the most active, due to the presence of excellent bars, clubs, hotels and more. It is also known under the name of Thailand Route 3 and it was named with that name in honor to Phra Bisal Sukhumvit, the fifth chief of the Department of Highways. He did an excellent job in developing the road infrastructure of Thailand during the 30s and 40s. The Sukhumvit Road was built in 1936 and since then it has been one of the most important roads in the country, and it gave birth to many Sois, and therefore, to several businesses, hotels, restaurants, bars, etc. This is the brief history of this important road and boulevard. Now, let’s talk more about Soi 11. It has earned the title of the most entertaining street in Bangkok and there is no doubt about why. Thanks to the many excellent venues you can find here, it is very hard to get bored. It is almost as old as the Sukhumvit Road, and since the beginning, it has been the capital of nightlife in the lower Sukhumvit. In fact, here you will find some of the oldest and most iconic pubs, bars, clubs and hotels in Bangkok. If you want to live the best experience during your trip, then you definitively have to visit the Soi 11. 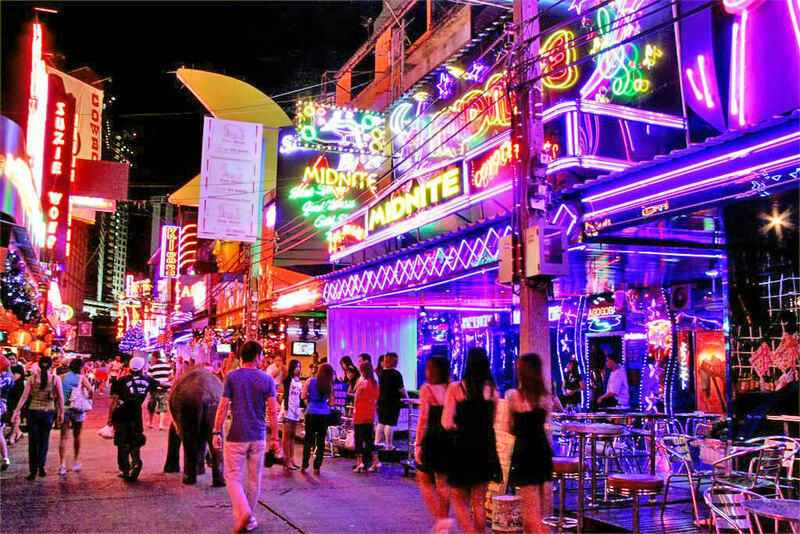 Historically, this street has been much different to red-light zones like Soi Cowboy or the Na-Na neighborhood. Since the beginning, it has been a place for fun and exciting bars and nightlife venues, where you can meet expats from every part of the world as well as locals. Although, it is true that the development of this street thanks to the economic boom that started in the 1970s. This is the decade when Thai economy started to take off, and since then, tourism to the country increased, and therefore, the development and economic growth of the entire country including Soi 11 and other iconic locations. Now, it is about time to talk about the attractions and what to do in this part of the city. No idea on where to say during your visit to Bangkok? Well, in this street you can find many of the best places to stay in the city, and here you are going to find suggestions on the best places to stay. This is one of the most representative and popular hotels in Sukhumvit Soi 11 and for a good reason: the place is beautiful and has everything one needs to enjoy a pleasant and relaxing stay. The rooms are clean and comfortable, however, one of the main attractions of the hotel is the bar. There you will find good music, great cocktails and meet other tourists. Moreover, the pool and gym are top of the line. Therefore, it is not surprising to know that many tourists love this hotel, because it offers more than just a place to stay, because it is somewhere where you can enjoy! This is another of the most popular hotels in this street. It does not have tons of luxury and the rooms are not very big, but they are nice and comfortable. However, it is near to nearly everything that is good in this Soi, therefore, a good place to stay. The sky train is very near and there is security 24/7, so you can feel safe at all times. Moreover, it is not expensive at all. The service is great, and thus, a good place to stay during your stay in BKK. They also include nice details like free welcome drinks, something that is very cool. On top of that, Wi-Fi is free and you get 10% discount on food and beverages. Similarly to the Salil Hotel and Alog Bangkok Sukhumvit 11, the location is incredible. Everything is just a few steps away, therefore, if you want to explore everything about Soi 11, then this hotel will make things easier for you. It is another excellent budget-friendly option in case you do not want to spend a small fortune in a luxurious hotel. You will get everything you need for a nice, comfortable and pleasant stay. The staff and service is also excellent, and this is not strange at all, because Thai people are known for being very friendly towards visitors. Overall, it is a nice option especially if you are on a budget. It is near to everything in Soi 11 and meets all the requirements for being in this list. This is one of the best hotels you will find not only in Soi 11 but also in the entire city. The rooms are top of the line, comfortable and modern. The location of the hotel is ideal for tourists, because everything is easy to reach. It is very relaxing and the service staff is friendly and efficient. The prices are accessible, something that makes it a good pick for budget travelers. You can go to the markets and malls very easily, because it is very close to them. Moreover, the BTS station is very near as well, something that make this hotel ideal for tourists. In conclusion, we can recommend this hotel hands down, because it checks all the boxes. and active Sukhumvit. Here you can come back after a night of adventure and find peace and relaxation. It is 5 minutes away from the BST station, which means that you will not have problems with transportation. You are near to the best restaurants, markets, attractions and more. You can choose between five different types of rooms and you have many amenities at your disposal: swimming pool, fitness center, Wi-Fi, etc. Moreover, the hotel has a restaurant as well that is pretty good. In conclusion, this hotel is a solid pick if you want to stay in the capital of nightlife in Bangkok. You have five hotels where to choose from. Now, it is time to talk about other important venues in this part of the city. Let’s continue! There is no doubt about it: Thai food rocks, and especially in the restaurants you will find in this part of the city. Here you will find a list of the best places to visit, so you can go there, eat and send your taste buds on a delicious journey! However… we are not only going to talk about Thai food, because we will also bring you some other cool alternatives. This restaurant in special due to many reasons, and one of them is that you will find a Märklin train in the middle, therefore, it is also known as the “Train Restaurant”. The menu is gigantic, therefore, you have lots of options at your disposal. The Thai food in this restaurant, which is what you have to try, is delicious. Make sure to order the most important Thai dishes like Tom Yum Goong, Gaeng Daeng and Pad Thai. The prices are very reasonable, therefore, you can enjoy of a good meal here even if you are on a budget. Moreover, you can also enjoy of live music in the garden of the restaurant, and this is a nice plus if you want to add something different to the experience. In conclusion, an excellent restaurant right in the capital of nightlife in Bangkok. You should definitively give it a visit, you will not regret it! It may not be the cheapest, but it is a good place to enjoy authentic Thai food. The flavor of the dishes is quite good and the menu is generous in options. The atmosphere of the restaurant is good and pleasant, which means that you will not only enjoy of a good meal, but also enjoy the environment. Therefore, if you are looking for a good Thai cuisine experience right in Soi 11, then you should consider visiting Chilli Culture. In conclusion, it is an excellent restaurant that you should visit. It is not very cheap, but the price is worth it due to the delicious flavor of their dishes. This is a great restaurant if you are looking for delicious traditional Indian food. Not in vain people love this place, because it checks all the boxes: food is incredible, the atmosphere is great and the service staff is efficient and friendly. They really take their job seriously, therefore, you can expect solely the best with every dish you order. This is something that previous clients can vouch for, therefore, it is a good place to take into account if you want to eat in Soi 11. They are very skilled at the grill, therefore, it is a good idea to order grilled dishes. The unique downside is that it is pricey, but in our opinion, it is worth it, because the food will not fail to delight you. Guaranteed. The name is not very Thai, but the food is delicious. If you are looking for a cool restaurant with delicious food and good live music, then The Australian Pub & BBQ is the place to be. According to locals, expats and tourists, this is the best sports bar in the area, therefore, if you are looking for that, then you are going to love this place. The snacks are good and it is a good place to hang out with your friends and watch a match. The menu is good as well, because you have many options at your disposal. Moreover, you can also enjoy of live music and entertainment. Therefore, if you are looking for a spot that is not so Thai, then you have a good option here. Here you have it, four excellent restaurant recommendations. 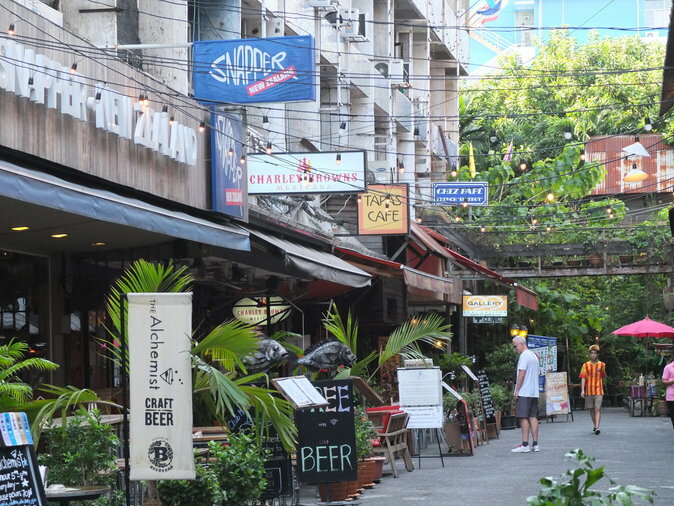 Now, it is time to talk about the attractions you can reach from Soi 11. What Attractions Can You Visit from Soi 11? Unfortunately, there are no many historical or important attractions in Soi 11, but there are many that are near to this street. Let’s explore what options you have at your disposal. If you want the ultimate shopping experience, then you cannot miss out Terminal 21, which is located between Soi 19 and 21. This market is special because it recreates different places from around the world. Here you will find approximately 600 shops, therefore, it is the ultimate shopping experience! If you are looking for a space of green in Sukhumvit, then the Benjasiri Park is the place to visit. It was built to celebrate Queen Sirikit’s 60th birthday in 1992, and since then, it has become of the most popular attractions in this part of the city. You can find this beautiful park next to the Emporium Shopping Centre, on Sukhumvit 23. Not everything in Sukhumvit is wild, because you can also find a museum like this one. It is located on 131 Thanon Asok Montri, Sukhumvit Soi 21, and therefore, very near to Soi 11. You will not believe that this peaceful place is located right next to Asoke. It sounds like a joke, but it is real, and you have to visit it to believe it. Thanks to this museum, you will submerge yourself in the traditional rural Thai life. You will see how people live and many other interesting things. If you can, then you should definitively visit this place. You will not regret it, so go for it. Now, if you are looking for a more interactive attraction, then you need to visit Lazer Game on the 5th floor Holiday Inn Sukhumvit Hotel, Sukhumvit Soi 22. The game lasts 15 minutes, but you will really feel them. There are different types of games, but the most common is team vs. team, or if you want, you can play also play everyone vs. everyone, where every man has to defend himself. If you are looking for something different, then you have got to give this a go. You will not regret it, especially if you travel with kids, because they are going to love it. If you want something more than a calm night in a pub, then you need to visit the Soi Cowboy. Here you will find go-go bars and other naughty attractions. It is one of the most popular destinations in this part of Bangkok, therefore, if you are up for it, then you should visit. If you want cheap drinks, then take into account that some bars have happy hours that go from 7:30 pm to 9:30. You can get drinks for as low as 70 baht! Refuse to give eye contact to anyone when entering to Soi Cowboy. If you do, then they will come to you to offer you their products or services therefore, just avoid eye contact and you will be fine. These three tips are more than enough to help you experience the best this Soi has to offer. It is not for everyone, but if you are up for an adventure, then you are going to like it! Now, here we have another interesting attraction, which is especially good if you are traveling with kids. You can find it next to the Benjasiri Park, on Sukhumvit Road, Phrom Phong. As you can easily guess, this park is dedicated to dinosaurs of all kinds.  The experience is very interactive and realistic, and that is why we recommend you to visit it, because you will not be disappointed. The realism of the models is amazing, and you have got to witness it with your own eyes to believe it, because you are going to be speechless once you do it! Here you have it. Now you have many excellent places to visit during your stay in Soi 1. You know where to stay, where to stay the best food and what attractions to visit. Anyway, if you have any questions, just let us know. We will answer them as soon as possible, because we want you to live the best experience when visiting Bangkok!